For me two player games have always been a bit of a odd thing. Either they are deeply seated in the thematic/ameritrash tradition or they are eurogames so scaled down that they lose their charm. I’m painting with very broad strokes here, but I haven’t had much success with the format. One game that definitely broke this tradition was Targi from Andreas Steiger. So much so that is it in fact on my top 6 games of all time. I reached out to Andreas Steiger to have him do a designer spotlight. Thankfully he agreed and this is the result. My name is Andreas Steiger I am 42 years old and I live in South Germany near the city of Stuttgart. I am married to a wonderful Italian wife and have two lively sons who are nine and six years old. I work full time as a kindergarten teacher in a small private kindergarten with kids aged three to six. Due to the pregnancy of my wife ten years ago we discovered the world of modern board games. Before my wife’s pregnancy, we went out to the cinema and the theatre very often. But this became too exhausting for her, so we stayed more at home and began to start playing some games we had at home in the cupboard. Somehow this was so enjoyable that I went out to a game store and bought some more games. We were astonished how many different fascinating games and mechanics were out there and got hooked. Since then we are game fans that play regularly as a couple at least two or three times a week. This is very precious quality time for us. Besides boardgames I have another hobby that I love very much, I play improv comedy theatre two times a month. We have specialized on improv crime comedy shows, that is always a lot of fun to play. I also buy quite a lot of games, so constantly new great game are added to my collection, and therefore new games enter my favourite games list all the time as well. Many people who are not involved in the board game hobby know only games that are purely luck based (which I find personally not that interesting) but on the other hand I don´t want to overwhelm them with too much strategy at the beginning. Therefore when I introduce new people to the hobby, I am trying to show them games, where the decisions of the players matter but there is also an element of luck. I have had very good experiences with the game Stone Age that has interesting decisions during the game but also the luck of the dice. This game was a big hit with everyone that I showed it to. Playing board game with my wife. Only my wife and me. As mentioned already, this are very precious quality times for us. I truly believe that gaming together strengthens a relationship. I once heard the saying: Couples that play together, stay together. There is a lot of truth in that. Playing games allows you to spend time together within the secure borders of the gaming experience. If you feel the desire to talk during a game, you can talk to each other, but not to talk at all is also completely legitimate and accepted. Also you have a friendly competition within these borders. I host a game group that meets every two weeks in my house. The people who come together, play together, interact with each other and talk to each other are totally different people with different interests and social status. They surly would not have made contact otherwise in life. But the games bring them together and relationships are being made, that reach farther then the board game experience of our meetings. That is very fascinating and something, that beside board games very few things achieve to do. Because I wish to become a happy person, you need to do the things that you feel you should do. You need to start acting. That gives you satisfaction in life. Like in many gamers life, there came that moment when I thought: “Would it not be cool to have your own game?” I think it is important and fulfilling to hear and react to you inner voice. To the things you want to try, want to do and want to achieve. Therein lies a big part of happiness. I try to live my life with that philosophy. One day I thought: “I want to play improv theater on a stage”, and now I do, because I pursued that idea. I visited workshops and joined an improv theater group. One day I thought: ” I want to get that job” and I did, because I took the steps that were necessary to get it. I want to encourage everybody to follow your dreams by taking the steps you need and start pursuing your ideas, and you will succeed. I made this experience over and over. So one day I had that wish, to design my own game and I started by making a list of things that I like in a game. I implemented that list in my prototype, designed a game that my wife and I would like. I told my wife: “If nobody wants that game, than we have a great game just for the two of us!” Luckily other people liked the game as well. So I design games, because I feel the need and the wish to do it. 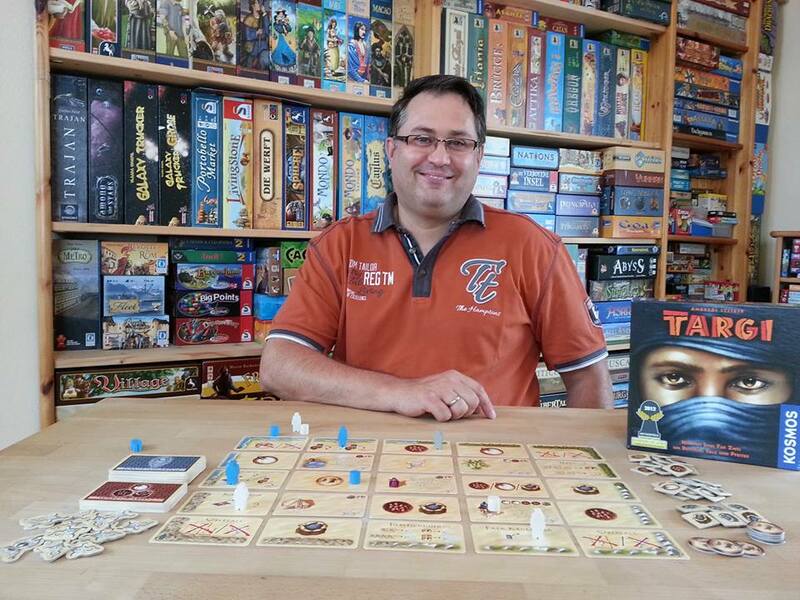 In the board gaming part of my life, I am very proud that my prototype for Targi was released nearly unchanged by the publisher and therefore stayed the way I designed it. Also I intended Targi to be a game that brings especially couples to the table together and have a good time with each other. From the feedback I get, that is happening. Generally, to make a game that I want to play! I don´t live from designing games. So there is no financial pressure to make a lot of games, it is just a hobby. So I want to make sure, that every prototype that I show to a publisher, is a game that I want to play as well. Also the thought that there are people out there, who enjoy something I made and have fun with it. From the mechanics. Ideally theme and mechanic work well together in a game. But if not, I think that a game with a strong mechanic but a weak theme works and plays better than game with a strong theme but a weak mechanic. With Targi, my first thought was, that I wanted to make a worker placement game (my favourite mechanic), in which every worker that you place would affect more that one things at once. This idea resulted in the unique intersection mechanic of Targi.The story about the theme of Targi is quite funny. I just had bought the animeeples for my first edition of Agricola. So I had the white, brown and black cubes as spare parts. I just started to work on Targi and needed some cubes to represent the wares in the game. So I thought, what could the colours white, brown and black represent? I thought of salt, dates and pepper. So I googled if there was a tribe that traded these goods. 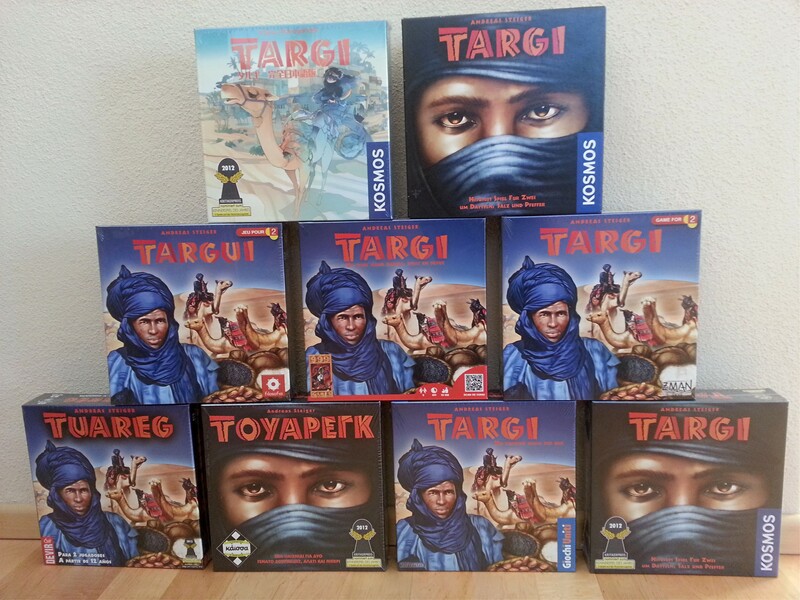 And there was one, the Tuareg! One single male Tuareg is called Targi. So I had in one instance a theme, a setting and a name for my game. I once read a story about a young juggler, attending a circus festival. Between all those artists he saw another older juggler, that was way better then all the others. He asked him: “Where did you learn to juggle in such a awesome way?” The man replied: ” Because I draw my inspiration for my performance, from everywhere and everything, not only from juggling!” That also is true with game design. Inspiration can come from everywhere, a book, a story, a movie, a song, from other games etc. Do you see any special challenges or advantages when designing a two player only game? The main benefit, when you are designing games for two players and you live in a house with your main gaming partner is, that you can easily play test your game. I find it also easier to balance the game play and special abilities when you have only two players and don´t need to consider in a third or forth factor. The main challenge is to keep the game challenging and avoid zero sum decisions in the game. That means that one decision of one player is nullified by the second player and none of them has the feeling of improvement and advancement. It is also a little more difficult to implement replayability and variety. By the way, all of my other prototypes are all two player designs. Do you have any news on a Targi expansion? But the long development time really improved the expansion, from just a bunch of new tribe cards, to some great new gameplay elements. I hope you enjoyed this interview with Andreas Steiger. If you would like to follow news about Targi you can check out this facebook page.